One of the fundamental pillars of ALWEHDAH's establishment is to support the needy, both locally and internationally. 1. Public fundraisers, licensed by the Commissioner of Charities, Singapore. 2. Private donations, through our network of members and supporting partners. Over the years, many Singaporeans - both Arabs & non-Arabs - have demonstrated overwhelming support for ALWEHDAH's fundraising efforts. The management committee of ALWEHDAH extends its sincerest thanks and appreciation to all donors whose generous contributions have enabled ALWEHDAH to continually take part in such humanitarian causes. 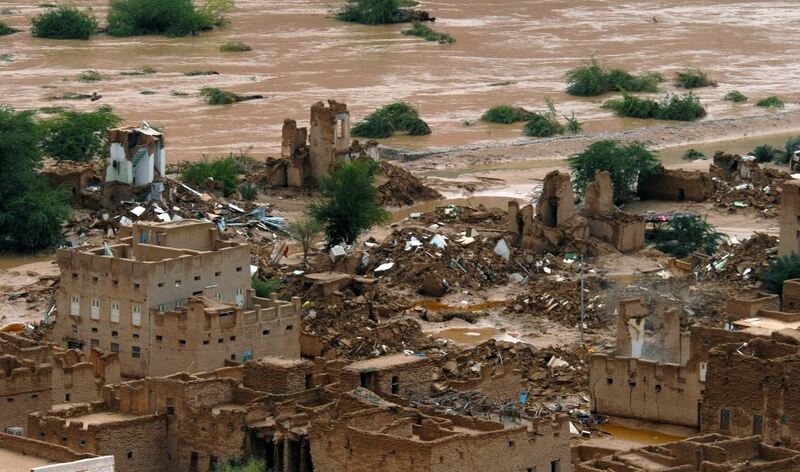 On 24 October 2008, the Hadramout and Al-Mahara regions of Yemen were hit by one of the worst flash floods in their recorded history. Within just two days, floodwaters claimed nearly 200 lives, displaced up to 25,000 people, and caused an estimated US$1.2 billion in damages. The devastation of the floods was a long way from Singapore, yet the desire to help the victims was very close to home. In the wake of this tragedy, ALWEHDAH mobilised its members and volunteers immediately to discuss ways and means to aid the victims of the floods. The issues discussed during the meetings included formulation of strategy and the type of humanitarian needs of the floods victims. A total of five (5) people in two teams went on a disaster relief assistance mission. In all, S$85,000 worth of items were collected. One of the main objectives of ALWEHDAH's mission was to liaise with the authorities in Hadhramout, and to ensure that relief items were distributed directly to the people whose homes collapsed in the aftermath of the floods, or were made inhabitable. The items distributed included clothing, food, water and household kits; other forms of assistance included outfitting 60 homes with water heaters and providing kitchen utensils, and underwriting the cost of providing temporary shelters for families whose homes were totally destroyed by the floods. Upon arrival in Hadramout, ALWEHDAH representatives were warmly greeted by Dr Hussien Al-Gunaid, Deputy Minister for the Environment, and Dr Hussien Al-Haddad, Director-General of the Ministry of Health and Population, who accompanied them on several visits to the affected areas. 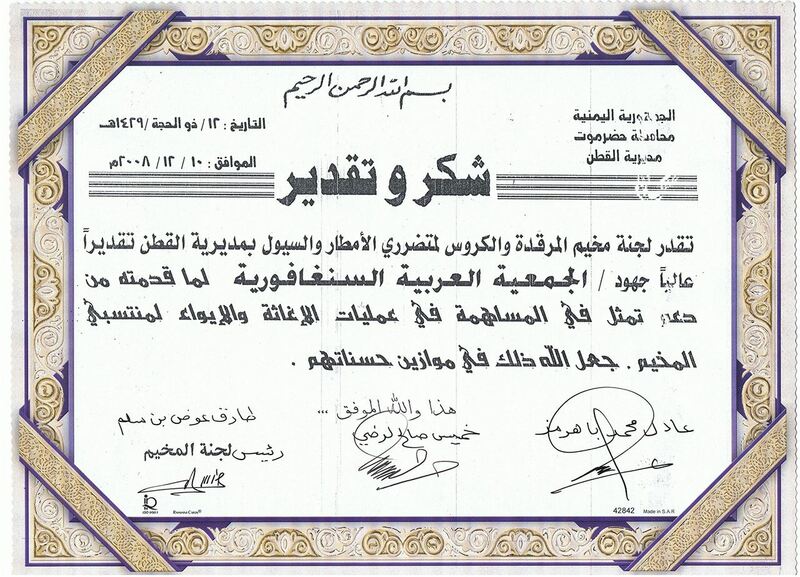 Certificate of Appreciation issued to ALWEHDAH, by Mr. Adil Barhamoos (Al-Qatn NGO representative).